the light is all: Photo of the day: Got bubbles? Got bubbles?, a photo by The Bacher Family on Flickr. Seriously, for a photographer who loves to capture the endless variations of light, what's better than soap bubbles? Especially when you're working with an expert bubble maker like this one! 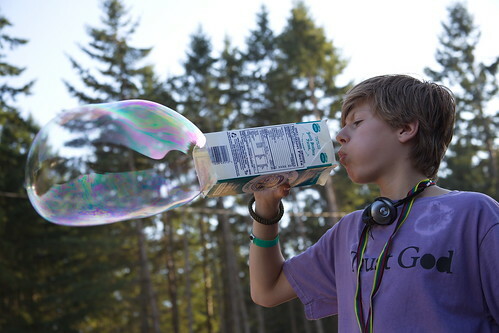 I would never have thought of using a milk carton to blow bubbles, but as you can see, it's fantastically successful. The bubbles don't tend to last beyond the end of the carton -- no immense bubbles floating off into the sky -- but they sure are cool coming out in all their multicolored immensity. Bonus points if your bubble blower is wearing clothing that matches the color of the bubble.